Yep much to all our surprise we kept telling ourselves it would be a girl, even though we all new it was a boy so when the tech told us. 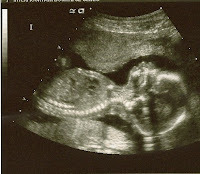 I guess I should say when we all say it was a boy we were not surprised at all. So I expect all you to get on the ball listing names galore, or else this child will be nameless. Although I love the name Alcatraz (thanks to my favorite aunt) I don't think it would go over well.. haha! 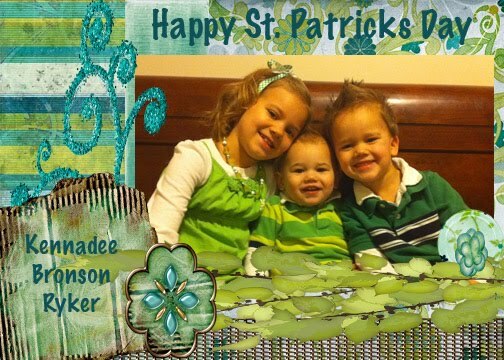 Kennadee is slowly accepting the fact that she is having another baby brother. Ryker thinks its cool since he can hit me, "because boys hit" at least thats what he tells me. The best part about it is that everything looks great and they moved my due date up. Less time the better, right? Chelsea had a shower in Idaho that I was asked to help with, but was unable to go since we had our Grand Opening for or new store the same day. Chelsea wanted our kids to be there so she was way to nice and offered to take our kids up to Idaho with her. I have to admit It was nice getting so much I wanted to make a nice favor for the guest chelsea invited since there wasn't much done, the kids loved far away grandma's house. I wanted to do something nice for the guest Chelsea invited well when my brain gets spinning it sometimes gets a little crazy well a little wrapping paper, and take out boxes get you this. Here is a picture of cute mommy opening our present. 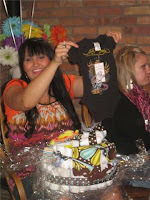 I found this darling Ed Hardy onsie I can't wait to see baby Matini wearing it in August! Saturday night Jackee and I hoped on a plane to NY to shop and go to a show. After a red eye flight we got to JFK at about 5:30 am. We then took a taxi to our hotel where we crashed for a few hours so we could get some serious shopping energy! We went to Times Square first so that we could go buy show tickets from tkts. We then got back on the Subway and headed to my favorite place, Canal street. All the crap you can imagine, actually the only reason I like it is because what you pay $80 for at a jean party is only $35 on Canal street, so after getting a few jeans and of course a cute purse we headed back to go see our show. Since the Tony's were Sunday several of the shows weren't running so we decided to go see 9 to 5 it was a great show. The main character is an actress off of 30 rock and the other two supporting characters were the witches from Wicked last year and they all were classic. Once all was done we walked down to Radio City where the Tony's were that night there were people everywhere and roads blocked off. The mall of America Ave. was turned into canal street, so instead of shopping I got corn on the cob that was Davine. On Monday we went to the Museum of Natural History. We learned about Dinosaurs, people, and the big bang theory. Jackee and I were a little spent so we were just having fun. Dad was so excited we made him go shopping he held up about 50 buildings and found a great resting area. The fine print on the sign lets you know to become a fan on facebook because of there cool waiting area. Whatever! Needless to say I'm glad Jackee needed someone to tag along so she could go. Thanks! On Saturday we did a live broadcast with 107.9 the Mix(the best radio station) for our Riverdale store Grand Opening. Well they were late and had problems with the broadcast so they felt bad. Well in turn I was given a meet and greet and tickets to the game/performance. Well let me tell you.... Some of you may think he is famous but to me he is just another guy so when they take you in they tell you. NO PICTURES, AUTOGRAPHS ECT. Whatever! Well the best part is still to come there was a mom that won a meet and greet from the station and had two daughters well they weren't going to let them in since it was only good for two not three. Well another lady in line had someone who hadn't shown up so I asked her is her person never showed if she would give it to the mom so she could go in with her 6 & 8yr old. Well I guess these two new each other for being neighbors growing up, well the lady I asked to let the mom in which was her friend was the person who is why the real stadium is even there. She had a bag of field tickets for the performance and gave Jackee and I each one! YAHOO! HAHA..... Well we couldn't stay since we were off to NY that night so we gave them to some of Jackee's friends. I don have to say the national anthem was amazing!